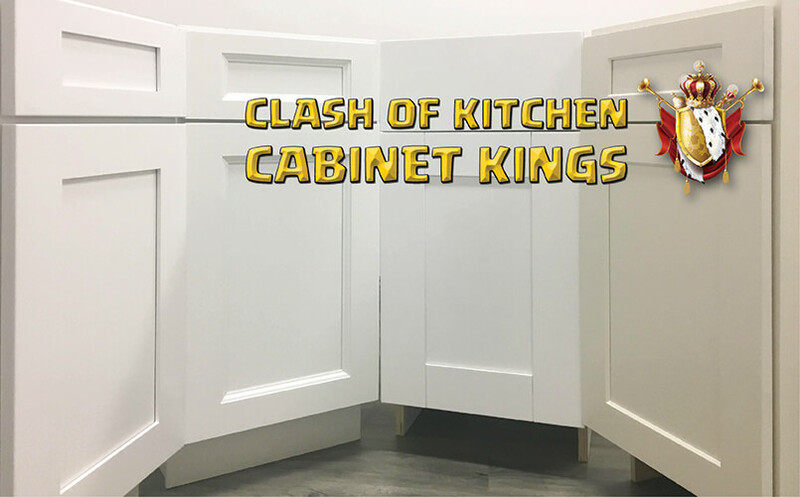 Four B15 white shaker cabinet units come up to bat in this head to head comparison between the models offered by online distributor Kitchen Cabinet Kings. Varying in price from $182.52 to $236.25, each of the Ice White, Thompson White, Simply White, and Shaker Antique White Shaker units offers both advantages and disadvantages over each other. Our goal with this comparison is to provide you with an unmitigated, honest, and comprehensive breakdown of which of these units chines within each category listed. Where one unit may have the nicest paint finish, another may excel in its ability to store items in the drawer and cabinet box. 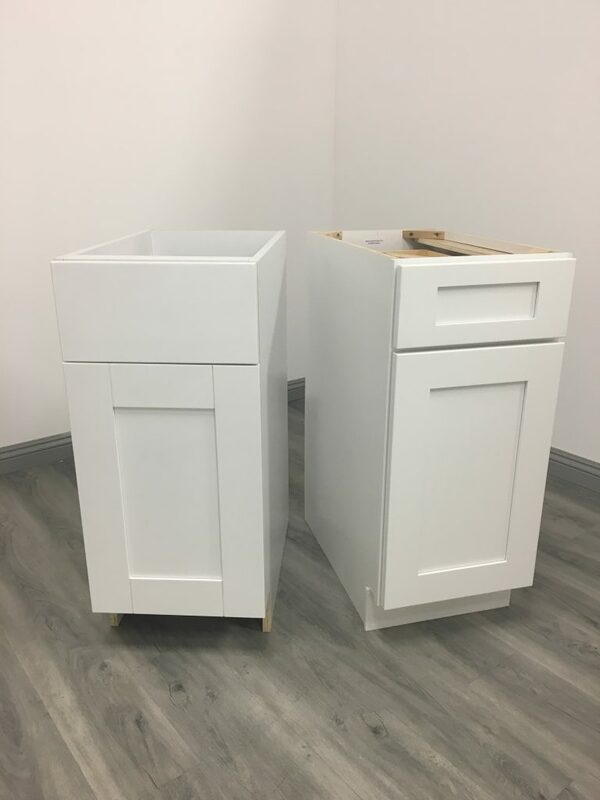 Since no cabinet is perfect, especially according to the grading system we have structured, ultimately the decision lies in the hands of the homeowner depending on the rationale for the space the cabinets will be occupying. Price tag is always an important factor, but we feel it is vital on our end (and most fair to you as our audience to give you the most critical information first before considering the retail value: “Is this a quality cabinet?” Understanding the answer to this question takes more than a quick glance over of a cabinet. 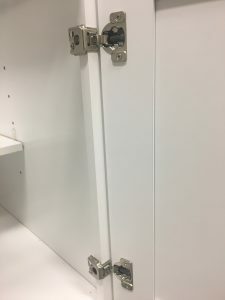 Careful inspection, some research, and tuning into the minute mechanics of every hinge, panel, and cam lock reveal exactly what type of cabinet we have in front of us. The following article consolidates our four reviews of the units from KCK and pits the units against one another. Ultimately, by the time you reach the end, we hope we have provided some insight into your future cabinet purchases and perhaps a bit of knowledge to pass along to friends and family who are looking to upgrade their storage units to RTA cabinet status. The wood or wood composite used in a cabinet determines several key characteristics in the overall quality of a unit: the stability, durability, and general aesthetic. Typically, we see birch wood combined with medium-density fibreboard composing the five-piece door and the unit frame. 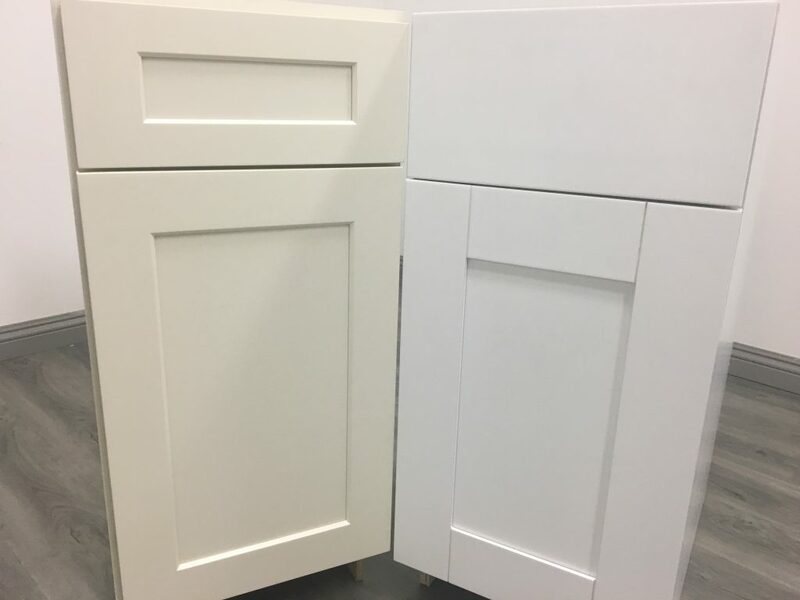 This is true of the Ice White and the Shaker Antique, but with the Simply White and the Thompson White solid beech wood and birch wood are used entirely in the build of these cabinet faces (Picture 2). With a slight bevel leading from the door and drawer frames to the middle panels, the Thompson exhibits stylish simplicity that is simultaneously effective and aesthetically satisfying. With slight routings between the stiles and rails of the door frame in addition to the slab-style drawer face, this unit catches our eye and a higher grade for several reasons. Acoustically resonate, capably assembled, and gorgeous to the eye, the Simply White’s unique implementation of beech wood sets this unit above the others offered from Kitchen Cabinet Kings and, quite frankly, above any other unit reviewed on the site (Picture 3). Between these two, the beech wood of the Simply White Shaker pulls through with the win. 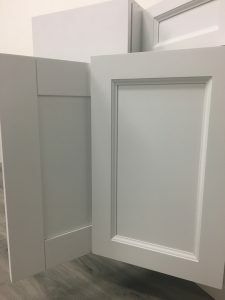 When considering the finish of a cabinet face, the type of wood or wood composition used in the build is just as vital as the act8ual paint and finish itself. This is mainly due to the fact that the type of wood determines how well (or poorly) paint and finish holds to the material, therefore defining the overall aesthetic of a unit. The competition for who holds the nicest cabinet face finish came down between the Shaker Antique and the Simply White (Picture 4). Depending on your preference in hue, either of these two cabinets will be more than satisfactory. Both exhibit thick coats, even texture, and a clean gloss. With the Shaker Antique, the paint is an eggshell finish while the Simply White is a crisp white. Personally, we prefer the aesthetic of the Simply White because the slab-style drawer face maintains the simplicity that has brought shaker cabinets into such high regard in modern kitchen designing. Each of the four units from Kitchen Cabinet Kings exhibits a different application of interior/exterior box finish. The Thompson White has the most unique with the eco-friendly GreenSure finish, but the contest again boils down to the Simply White and the Shaker Antique (Picture 5). personal preference will dictate your decision here, as the Shaker Antique has a very fine non-matching UV coated natural wood interior in contrast to the matching interior of the Simply. Our vote goes with the Simply White Shaker; the even application of paint/finish to the back, side, and bottom panels. We have yet to come across an interior matching paint applied as thick as this unit displays, especially considering the even texture and the sheer girth of the panels. With 3/4 inch thick box panels, the Simply White Shaker looks to be the top dog in the yard (at least on paper). 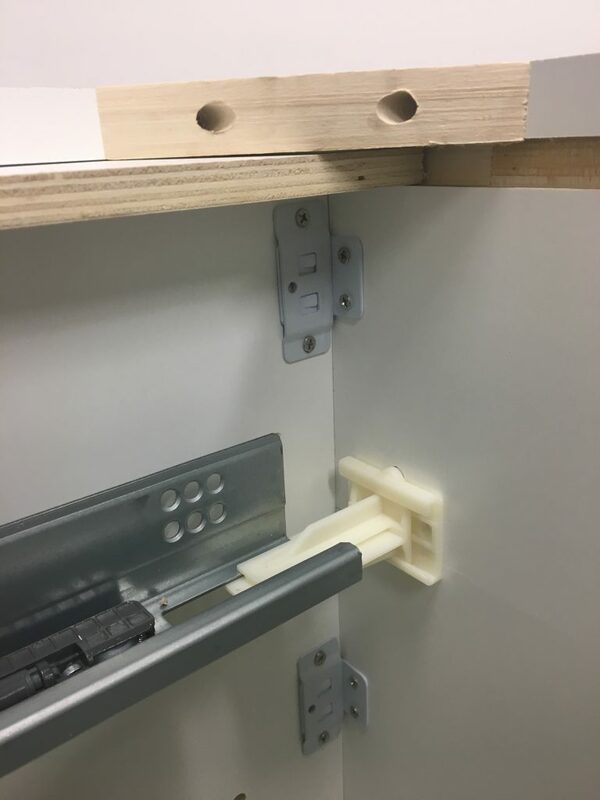 But the lack of connecting hardware and a toe kick really work as a major disadvantage for the stability of this unit, especially when coupled with the weight of these heavy panels (Picture 6). Finish nails are required for the final assembly, and even then the Simply White precociously wobbles from the lackluster panel attachment. Although the panels may be thinner than those found on the Simply White, it is the Ice White Shaker to which we give our vote of confidence. Complete with “I” rails running along the side panels for extra support, this cabinet is by far the most stable of the four and the “L” brackets holding the structure together are easy to fasten. 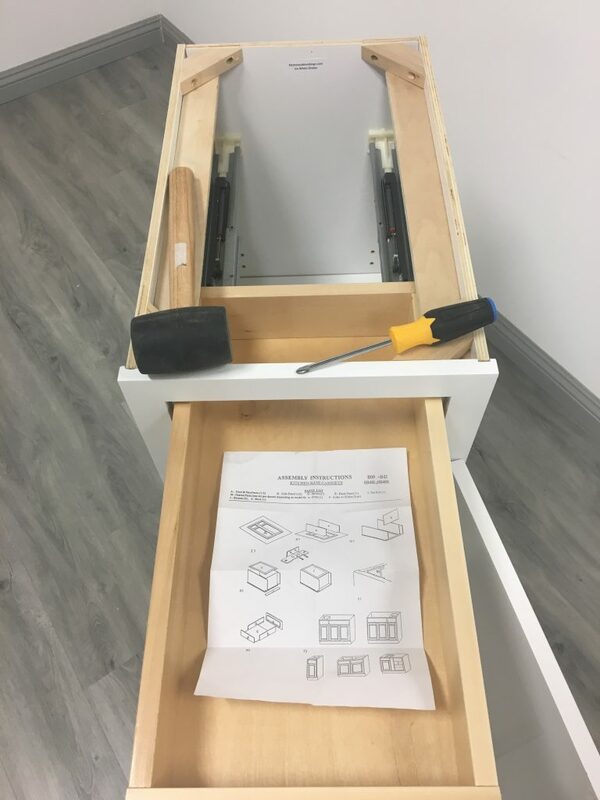 Drawer Boxes ask the builder to pay close attention to a number of seemingly minuscule details which in actuality reveal a lot about the quality of a cabinet unit as a whole. From panel width to the teeth of the dovetailing, bottom panel to the shape of the molding along the tops of the panels, we take a fine-toothed comb over each drawer box. From KCK, the Forevermark drawers of the Ice White and Thompson White are the highest quality. For the sake of giving them a fair run for their money, the metal drawer box of the Simply White presents a worthy opponent (Pictures 7 and 8). 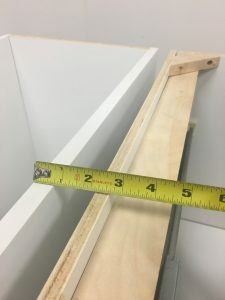 We have yet seen a metal drawer box come across our workbench here at RTA Cabinet Reviews, so the Simply White’s box immediately caught our eye. Assembling the brackets to the back panel which snap into the side panels was frustrating, but once this task is completed the box holds together quite well. 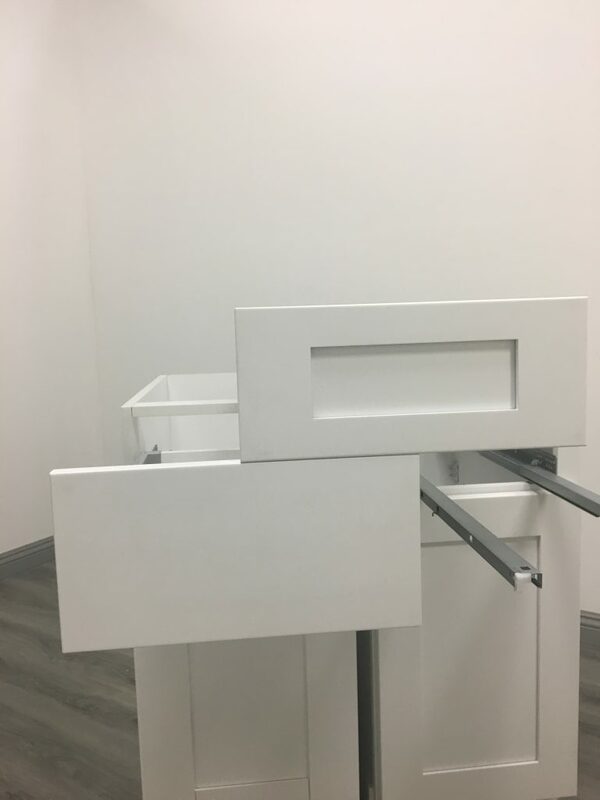 The drawer glides are built into the side panels, which not only saves on assembly time but is an innovative approach that sets the standard higher for other RTA cabinets in the industry. 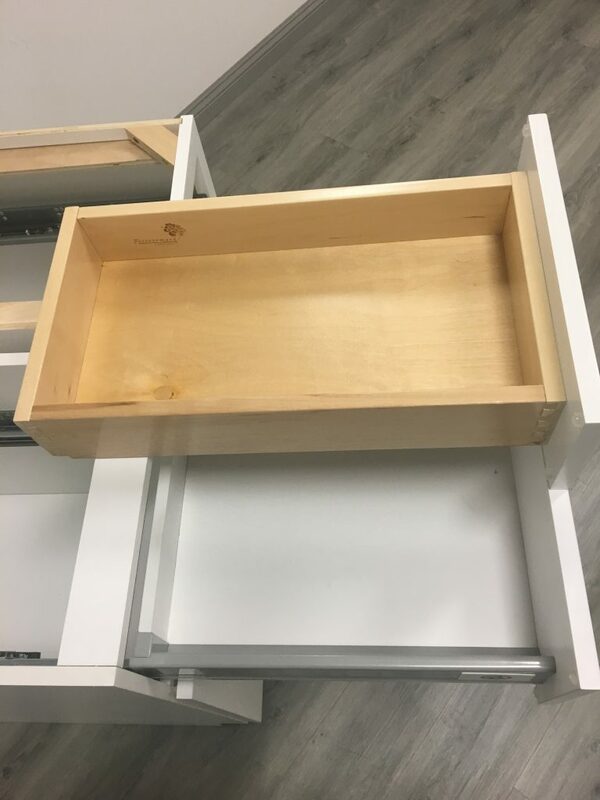 Where this cabinet ultimately loses to the traditional solid birch wood Forevermark cabinets, however, is with its lack of length (Picture 9) and general instability. The dovetails of the Forevermark drawer boxes are smooth, biting onto one another with a strong grip and boasting a clean aesthetic. While the slab-style drawer face offers a clean and different aesthetic, the traditional 5 piece cope-and-stick approach is consistent with the cabinet door (Picture 8). We can’t help but award Forevermark top marks for their quality drawer boxes. 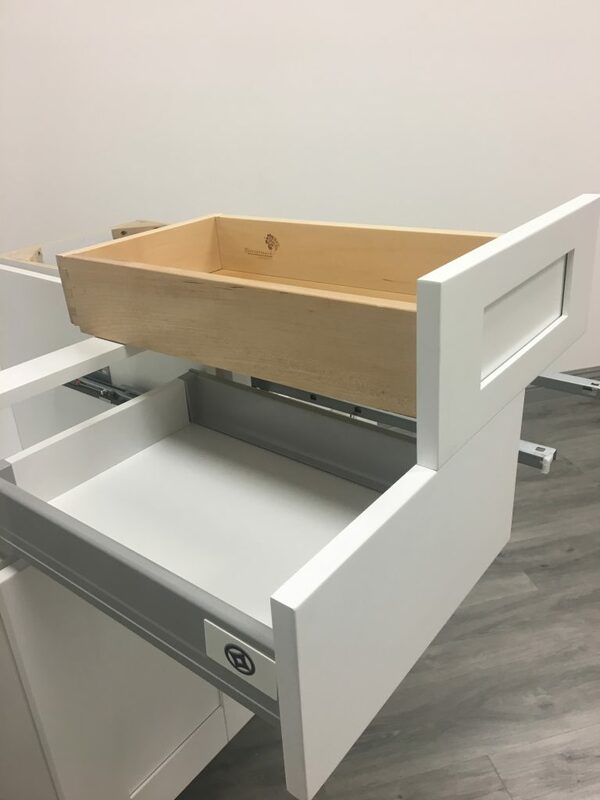 Drawer boxes also fall under our “Storage” category, as their dimensions directly correlate to the unit’s overall capacity to store items. As is evinced in Picture 9, the Ice White has a drawer that is 6 inches longer than that of the Simply White. 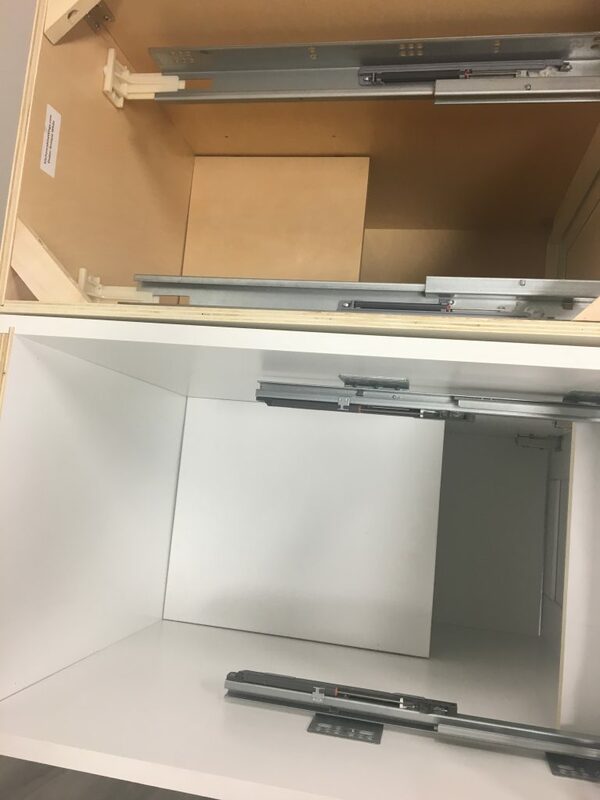 To make up for this lack of drawer length, however, the Simply White has an inner floating shelf 3/4 the overall interior of the box (Picture 10). Industry standard holds manufacturers accountable to only provide a floating half-shelf, so anything more than that immediately catches our here and earns points in our review. Another factor the Simply White has going for it is the very rare “Flush-frame” or “Frameless” feature. This is a characteristic seen mostly in European style cabinets; the fact this White Shaker espouses it is highly impressive. It makes retrieving items and cleaning out the box infinitely easier. Even with the inferior drawer box length, the Simply White’s longer shelf and frameless cabinet body make it the superior unit as far as storage capacity is concerned. 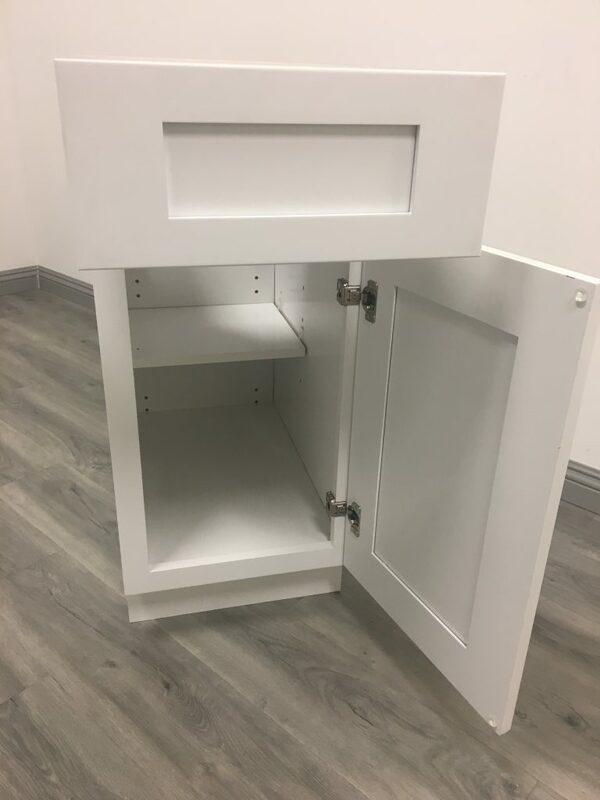 We decided to give the top prize in the hinge category to the Ice White Shaker for two reasons: the hinges are UCD, which are high-mid quality soft close hinges, and because they came pre-mounted to the cabinet frame and door (Picture 11). The rest of the cabinets required some assembly, but the Ice White Shaker arrived ready to be fastened and used. None of the hinges from KCK offer BLUM grade quality, but they are all still quality, reliable mechanisms you won’t have much if any, trouble in their functionality. The same UCD full-extension drawer slides with soft-close mechanisms come with the Thompson, Ice White, and Shaker Antique units. 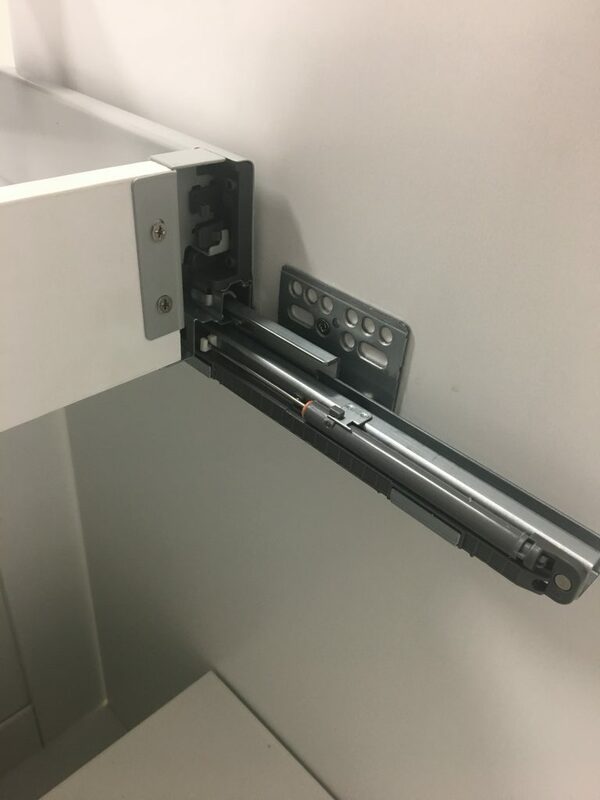 These are all quality, dependable drawer slides that are easy to assemble to can be trusted to last for years to come. 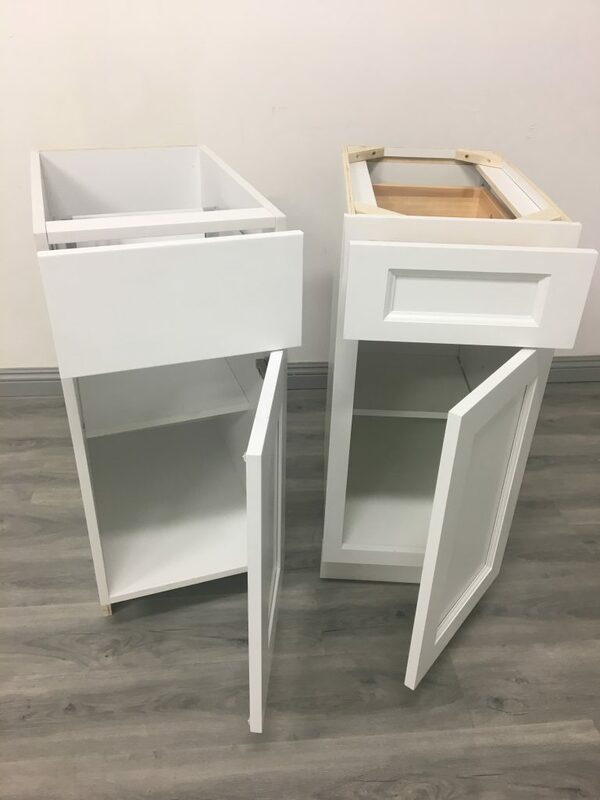 It is the drawer slides of the Simply White Shaker that catch our eye: built into the metal side panels, they maintain a smooth glide while offering a simple assembly once the aluminum brackets are attached to the back panel of the drawer box (Picture 12). The slides attach to both the left and right side panels by means of wood screws into appropriate pilot holes–just be sure to check the height of your drawer and adjust the slides to appropriately fit the full-overlay style of the cabinet face. 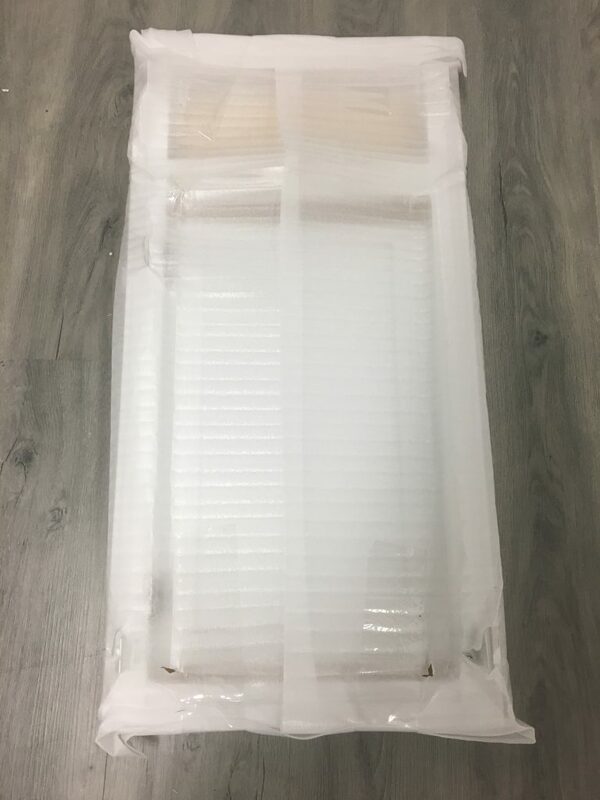 We are beyond impressed with the packaging encasing the Ice White Shaker. 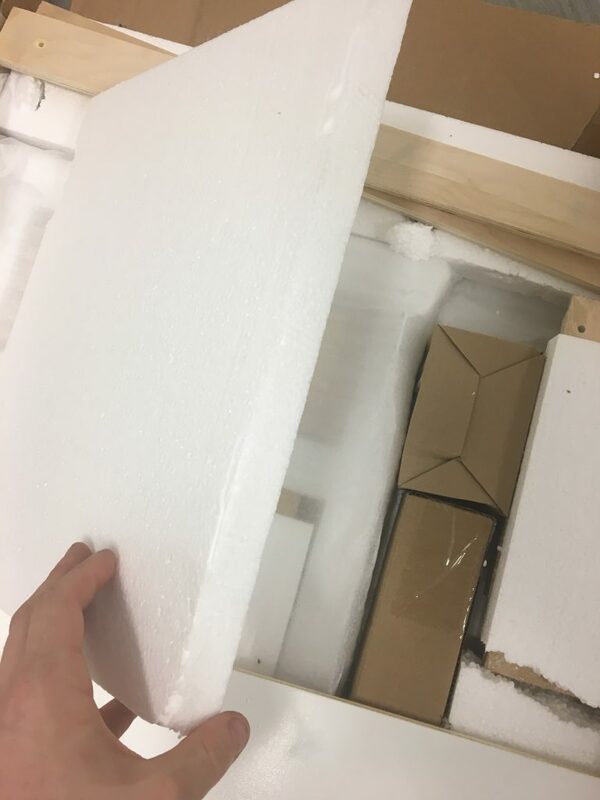 Everything from the exterior cardboard to the styrofoam cuts nestled in between the panels and connecting hardware illustrate the manufacturer’s dedication to ensuring their products arrive at their destination without damage. The door, drawer face, and cabinet frame are wrapped separately in thick plastic and styrofoam sheets. 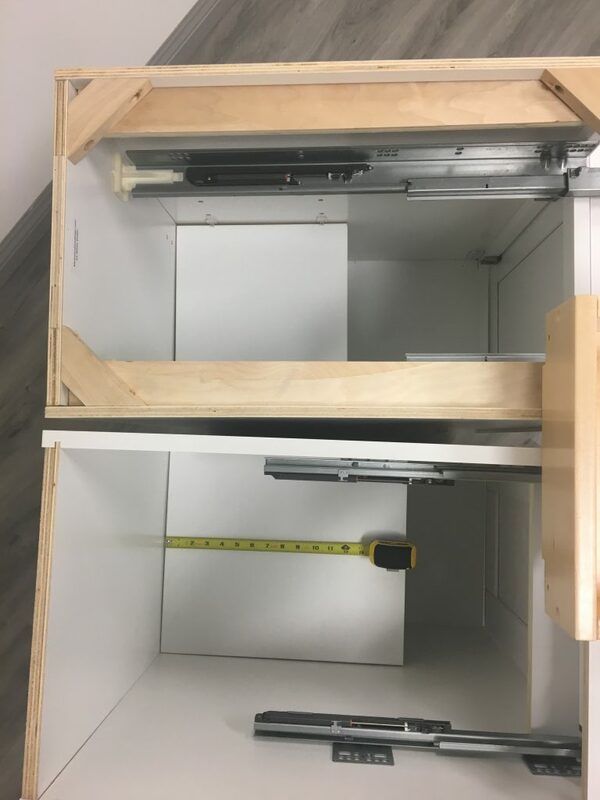 This makes the assembly process a breeze; what’s more, there is no visible damage to the cabinet face, which is evidence enough for us to give the wrap-job a high grade. 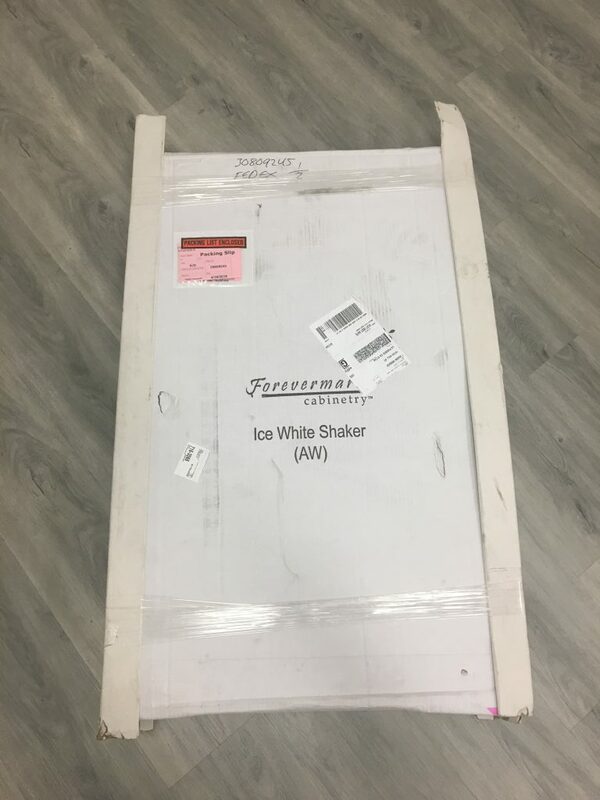 A huge indicator of the assembly process is the manner in which a unit is packaged, and in this arena, the Ice White Shaker succeeds on multiple levels. From the moment we opened the package we could tell the Ice White shaker is a very deliberately organized unit. This makes the assembly process very straightforward and manageable: from the cabinet’s face being separately wrapped (Picture 17) to the connecting hardware being placed in its own cardboard boxes, the presentation of the Ice White in its packaging keeps the builder on track to complete the unit in a reasonable amount of time. With “L” brackets that snap neatly into place, minimal tools are required beyond a rubber mallet and a hand driver (Picture 18). The only place the Ice White lost any points in this category is with the instructions included. Rudimentary pictures with zero written instructions roughly guide the builder through an inefficient process. 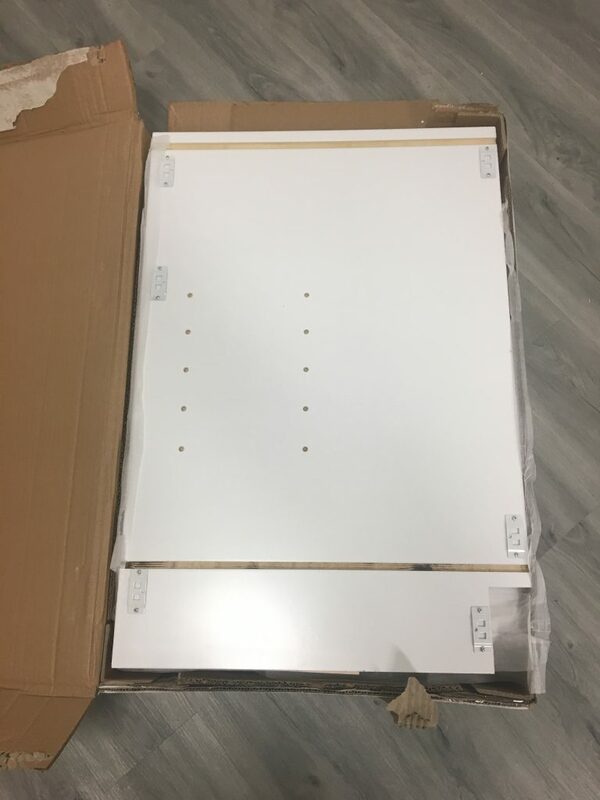 We recommend beginning with laying the pre-assembled door and frame face down on a piece of cardboard and snapping the “L” brackets on the side panels into place with the corresponding sleeves found on the back panel and the cabinet frame. The Support from Kitchen Cabinet Kings has proven very helpful; the online Live Chat team is quick to respond and knowledgeable in navigating their customers through the proper channels. I ordered replacement parts for the Thompson White and while they have been quick to respond through the Live Chat on their website and email, the replacement part has taken over two weeks to arrive. If one were to receive an entire kitchen and find multiple damaged pieces, waiting this long would prove very frustrating. Their team is not particularly warm in their correspondencem=, leaving the customer to feel disposable and perhaps look to take her or his business elsewhere. beyond this, they succeed in getting a cabinet to the doorstep and replacing necessary parts in due time. 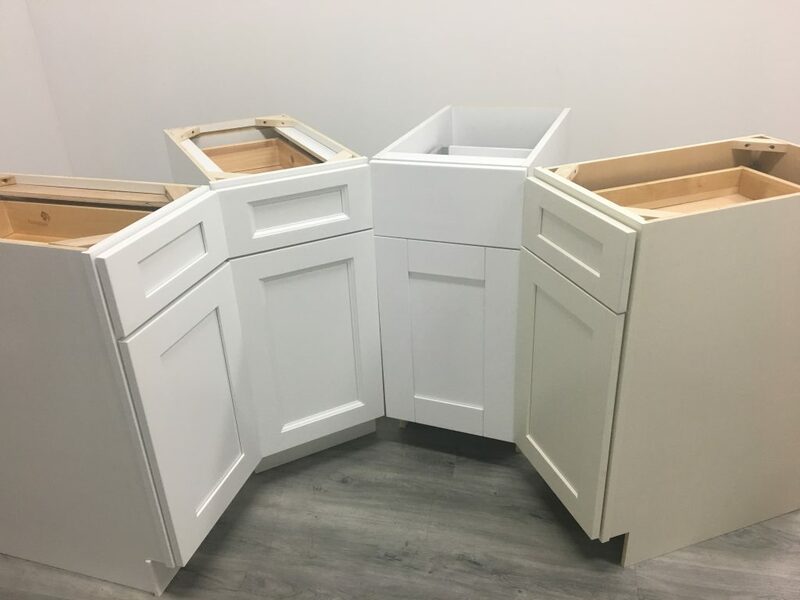 As has been the case with our previous comparisons between units from other distributors, each of the B15 white shaker units from Kitchen Cabinet Kings brings something different to the table we have not yet seen. We aim to sort through the negative and positive characteristics of each cabinet and present you with a summation of each variation as well as a grade based on our scale with a 5.0 being the highest rating in any particular category. From Kitchen Cabinet Kings, the obvious choice comes down to the Ice White Shaker and the Simply White. Both have a very fine, clean white finish that will open up any kitchen and play with natural light to create a sheik, modern aesthetic. The slab-style drawer panel and vertical door routings of the Simply White are a smarter, more affable look than the traditional 5 piece cope-and-stick method of door and drawer face assembly found on the Ice White. When inspecting the interior finish, the choice is between the matching white interior of the Simply and the non-matching wood finish of the Ice White. Personal preference will dictate choice here, but our vote goes with the natural wood grain of the Ice White. Storage capacity is as mixed a bag you can imagine with these two. Where the drawer box of the Simply lacks the length that the Forevermark drawer box of the Ice White exhibits, it makes up for it in width. Additionally, the 3/4 floating shelf in the Simply eliminates a bevy of unusable negative space created by a half shelf such as the one found in the Ice White. This allows more items to be stored in the box of the unit, thus giving the cabinet more presence and purpose in your kitchen. Where the Simply falls short are some very critical areas: the assembly process is a nightmare, requiring the builder to rent or own a pneumatic gun and a second pair of hands to properly hold the panels in place. Once this is completed, the unit is STILL perhaps the least stable of any unit reviewed on this website. This comes as a result of the heavy nature of the (admittedly very high quality) panels attached precariously to one another by means of finish nails and the fact there is NO TOE KICK included with the parts of the cabinet. Compare this to the straightforward and, frankly, an enjoyable assembly process of the Ice White Shaker and the sturdy nature of the unit, there is no contest that the Ice White dominates over the Simply White. Last we consider in our comparison is the price of each unit, as we feel the quality of the materials and functionality of the cabinet are the most important elements to take into consideration before deciding what unit suits your needs best. In the case of this comparison, the difference in price is rather astounding given the of the products you receive. At a current rate of $223.15, the Simply White Shaker from Innovation Cabinetry boasts very impressive beech wood composition and extensive storage capacity. Unfortunately for it, this wasn’t enough to top the Ice White Shaker at its current price tag of $182.62 for a B15 unit. 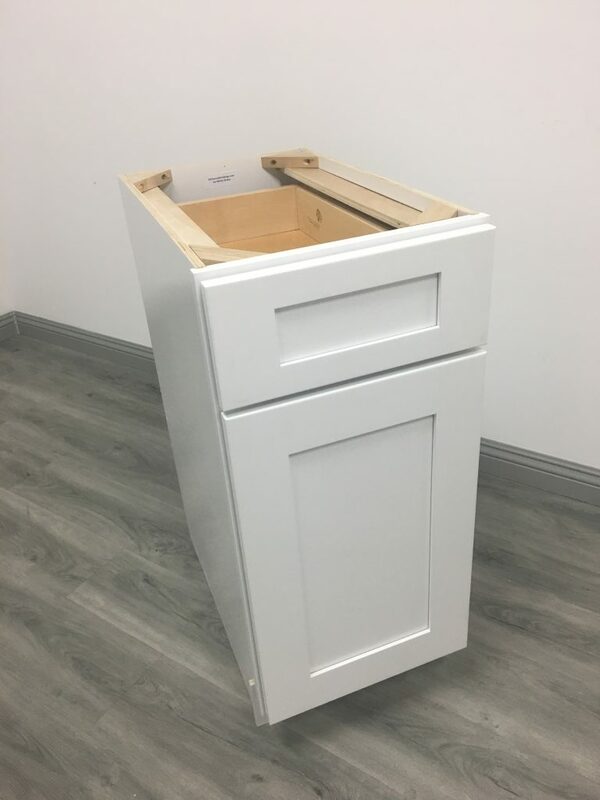 Sturdy build, careful packaging, a clean finish, and a gorgeous drawer box place the Ice White Shaker at the top of the mountain for the selection from Kitchen Cabinet Kings.